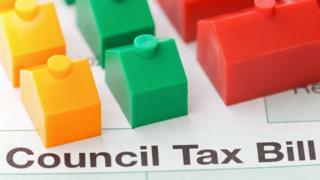 Residents of Caerphilly county will face a 6.95% per cent council tax rise after councillors agreed £14m in cuts. Schools, libraries and highways budgets will be hit, with public toilets due to close in the coming year. Planned cuts to community centres, meals-on-wheels, safety wardens, waste recycling and tourist attractions have been reduced or deferred. Council leader David Poole said the "low-hanging fruit" had already gone in £52.4m cuts over the last five years. The increase in council tax agreed by the full council on Thursday adds nearly £74 to the annual bill for a Band D property, up to £1,131 before police and community council charges are added. Plaid Cymru group leader Colin Mann claimed the council's Labour leaders were "charging more for less", saying his party had asked council officers to look at alternative ways of delivering services. Kevin Etheridge, leader of the independents, said the council tax hike was too high but also raised concerns about cuts to school improvement budgets. In response to the criticism, Councillor Poole said a balanced budget had been presented with "minimal" impact on frontline services and was one that reflected public views, according to the Local Democracy Reporting Service. He said the majority of people were "willing to pay a little more in order to protect the services which they value so much". The leader also told councillors that further cuts of £44m could be expected in the following four years, because of increasing demands for social care, housing and education.